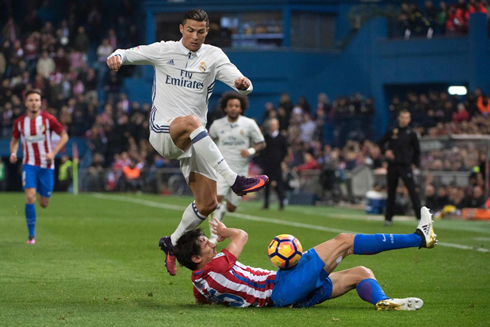 Real Madrid came out of the Vicente Calderón with the 3 points after a crucial 3-0 win against their rivals Atletico Madrid. 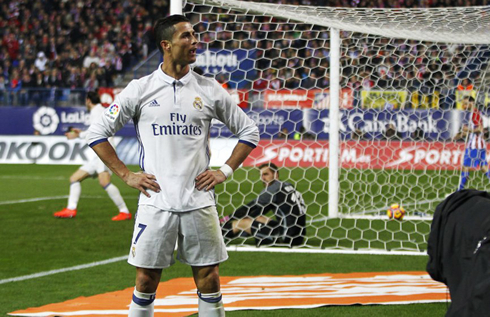 The hero of the night was Cristiano Ronaldo, who got to score a truly memorable hat-trick. 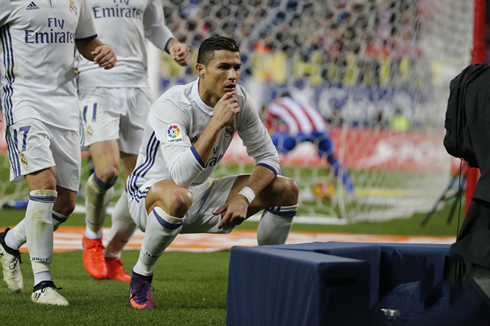 It was the last league derby hosted at the Vicente Calderón before the Diego Simeone's men move into a new stadium next season and Cristiano Ronaldo made sure his name would be carved in stone after another impressive performance in a Real Madrid jersey. The Merengues went on to beat Atletico Madrid 3-0 and are now on the top of the league 4 points clear of Barcelona and 9 points above Atletico. It's been one of Real Madrid's best performances this season, and certainly one of the club's best displays at the Calderón in Diego Simeone's era. Ronaldo only scores against weak sides, they said. Ronaldo never does the difference in big games, they said. Ronaldo is finished, they said. Well, once again, he silenced them all. With several important players unavailable to play in this game, Zidane trusted in the likes of Nacho, Kovacic, Isco and Lucas Vázquez to step up and give the team the consistency needed to face a solid side like Atletico. And the truth is that no one disappointed and Diego Simeone's men never got to dominate and impose their strengths as they certainly intended. 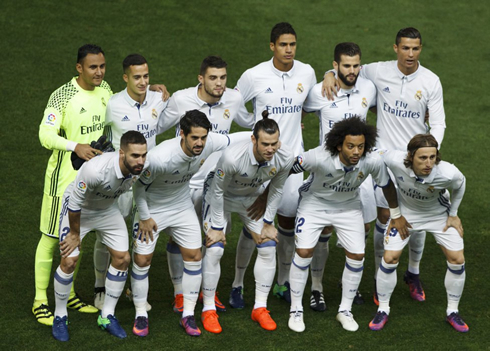 The opener arrived deep in the first half, following a free-kick earned by Lucas Vázquez. As usual, Cristiano Ronaldo claimed the right to take a chance at goal and he wouldn't regret trying his luck from such a distance. The 31-year old saw his shot hitting the wall, but was fortunate enough for deflection to trick Oblak and beating the Slovenian goalkeeper for the first time on the night. However, neither Madrid nor Ronaldo were finished. With 77 minutes played in this derby, Isco saw an opportunity to launch a deadly counter-attack and found Gareth Bale with plenty of space to run behind Atletico Madrid's back line. The Welsh moved the ball forward right until he started stepping inside the Colchoner's box and then assisted Cristiano Ronaldo on the far post. 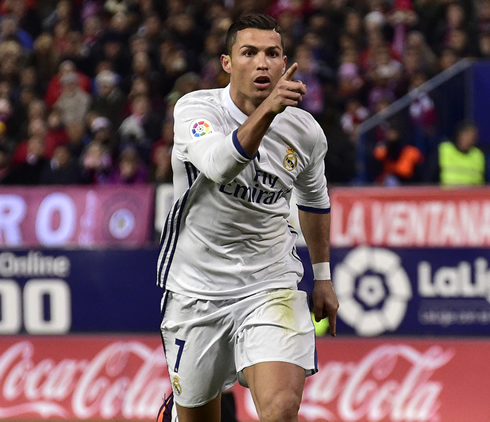 The Portuguese forward kept his composure and with a clean touch he beat Oblak for the third time, completing another career hat-trick. Attackers: Lucas Vázquez, Gareth Bale, Cristiano Ronaldo. Cristiano Ronaldo next game is a Champions League fixture for Real Madrid on November 22 of 2016, against Sporting. You can watch Juventus live stream, Sporting vs Real Madrid, Sevilla vs Juventus, Middlesbrough vs Chelsea, AC Milan vs Inter Milan, and Werder Bremen vs Eintracht Frankfurt, all matches provided from our soccer live game pages.